SACRAMENTO, Calif. (CN) – Calling for immediate repairs to California’s neglected dam and flood-prevention systems, Gov. Jerry Brown on Friday said it’s time for lawmakers to “belly up to the bar” and spend billions on infrastructure projects. Citing recent spillway failures at the nation’s tallest dam and statewide storm damage, Brown estimated the state is now facing $187 billion in unmet infrastructure needs. He introduced plans to dedicate $437 million to pressing flood-control projects, asked for increased federal relief and said that he’s “getting ready” to end the state’s historic emergency drought declaration. 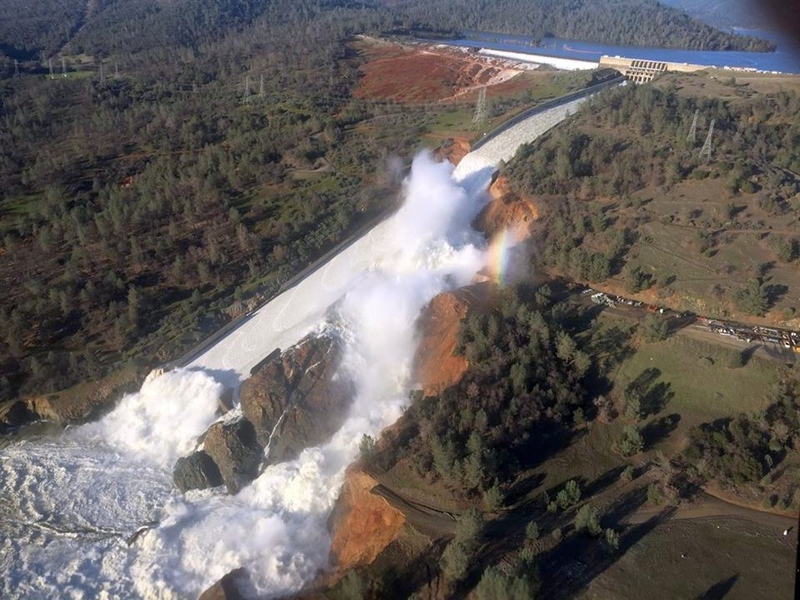 The Democratic governor’s proposal requires legislative approval and comes nearly two weeks after officials evacuated 190,000 Northern California residents living downstream of Oroville Dam because of severe damage to both of the dam’s spillways. Brown, who was criticized by some for not immediately visiting the dam in wake of the Feb. 11 evacuations, deflected claims that the state mismanaged the Lake Oroville emergency. After touring the dam on Wednesday, Brown said he was satisfied with the California Department of Water Resources’ response. “In general, we have a very expert department of water resources. It’s one of the best in the country,” Brown said of the department’s handling of the imperiled 770-foot-tall dam. Reporters peppered Brown, 78, about his strategy to drum up billions for repairs to the state’s decrepit dams, highways and roads. He said it will take a combination of new taxes, loans and help from the Republican-controlled Congress and President Donald Trump. “Somehow we have to bring these urgent needs to public attention,” Brown said of the possibility of tax increases. The governor’s urgent call for spending marks a dramatic shift from other press conferences during his fourth and final term. While the state has passed timely and balanced budgets over the last several years, Brown has consistently preached fiscal prudence and vetoed new spending proposals, although he has also advocated spending for the Golden State’s aging infrastructure. Brown painted California’s infrastructure situation as a serious threat, and broke the $187 billion infrastructure deficit into three categories: $50 billion for flood management, $59 billion for state highways and $78 billion for local streets and bridges. Meanwhile Assembly Republicans are pushing a $7.8 billion transportation package they say will be funded without tax increases. The minority party wants to divert $5.6 billion from the state’s estimated $122 billion general fund by steering existing vehicle sales and insurance taxes toward road maintenance. “No other transportation proposal contains all of these elements. We can act now to fix our roads without layering more taxes and fees on California drivers,” Republican Assemblyman Vince Fong said after Brown’s press conference. In classic Brown fashion, the governor maneuvered the press conference through a variety of topics. In less than an hour, he tiptoed through dam failures, climate change, continued support of the high-speed rail project and the state Democrats’ growing feud with Trump. With California on pace for one of the wettest winters on record, Brown was pressed about petitioning the federal government for flood relief while the state is still under his emergency drought declaration. He said the recent rains, which have pulled much of California out of drought according to the U.S. Drought Monitor, are indicative of California’s changing climate. “It’s pretty clear to me this climate change is coming, it’s coming faster than we thought,” Brown said, adding that he’s getting ready to end the drought emergency this spring. Despite the fact that state Democrats have routinely promised to defy Trump’s immigration, environmental and health care moves, Brown said Washington and California must coexist. In a letter to the Trump administration, Brown’s office identified 51 key infrastructure projects that need either federal funding or environmental review approval. The list includes Oroville Dam repairs, highway improvements and the $64 billion high-speed rail project.